The Short Version: It’s worth exactly what you pay for it. If you really need a reliable, high-capacity battery case that’s worth the inconvenience of carrying a brick then I don’t recommend this case. Mine has sat unused on a shelf for months. I may just charge it up once a month for emergency use at home. It does a good job of maintaining a charge when unused for a long period of time but unfortunately I started having a problem with the case randomly stop charging and then restart, even when it was sitting on a flat surface. I suspect the dock connector is failing, which is similar to problems others have mentioned in product reviews for this device. My iPhone 4 battery still works well but I have noticed that it doesn’t last quite as long as it used to, especially if I’m using it for power-hungry tasks such as playing a game or browsing the Web. I think I’ve treated the battery well by making it a habit to not leave it on the charger all night and instead only plug it in until it reaches 100%. This week I started browsing iPhone battery cases. I perused the reviews for several, but I couldn’t make up my mind. The battery performance drop wasn’t enough to justify spending $60-$80. At one point I jumped over to Monoprice.com and came across a backup battery case that had good reviews and only cost about $24. I went ahead and ordered one. It arrived today. Obviously I haven’t had this product long so I can’t attest to it’s endurance or charging capacity. I’ll update the post later, if I learn anything new or experiencing problems with the device. The case does make the phone larger. In fact, it’s probably about twice as thick, a bit longer, and twice as heavy. Personally, I don’t consider that a bad trade-off but some individuals may not like the case if phone size and weight is an issue. The case adds a small bit of protection, similar to the cover that I was using. One reviewer noted that the case slightly blocked some of the light from the camera flash. I haven’t tested that. The iPhone itself slides into a standard dock connector within the case. The case does not have a dock connector on the outside. Instead, it sports a micro USB port, which is used to charge the phone and case and can also be used to sync the iPhone with iTunes. I actually prefer this since those cables are much less expensive than the Apple cables (and it’s also the same type of cable my wife’s phone uses). Anyone that has iPhone accessories that work via the dock connector may not be interested in this case. However, removing the battery case is easy and only takes a few seconds. A reviewer on the Monoprice Website also mentioned that the actual charge capacity is closer to 50%-75% of the iPhone battery, as opposed to the advertised 100% (twice as much usage time with the battery connected). Operation of the case is very simple. Holding the power button on the back for less than two seconds will display the current charge level via four LEDs. Pressing the button for about three seconds will cause the LEDs to flash and the case will start or stop charging the iPhone. The only significant item of concern is that it seems to be easy to inadvertently cause the charge mode to be activated when the phone is in a pocket. Two or three times I noticed the phone was charging even though I hadn’t turned charging on. I doubt this will actually lead to a drain of the available battery power. Updated 08/22/2011: I ran into one problem that I forgot to mention. The first time I connected the case to one iMac it wouldn’t charge. It connected for a second or two and even showed up in iTunes, but then it would disconnect and the battery would stop charging. It didn’t take long to realize the problem was caused by how it was connected. I was plugging the micro USB cable into a USB extension cable, which was then plugged into a self-powered USB hub. Connecting the case directly to a MacBook Pro USB port via the micro USB cable worked perfectly. The battery never disconnected. I’m not sure where the problem in the other setup was – it could have been the extension cable or perhaps the USB hub itself just didn’t have enough juice. It probably would have worked fine on the other system if I had connected it directly to a built-in USB port. I tried it on a different iMac via a self-powered USB hub and it worked as expected. In fact, I was able to sync the iPhone with iTunes without any problems. Updated 08/31/2011: I’m beginning to suspect that the battery is trickle charging into the iPhone. 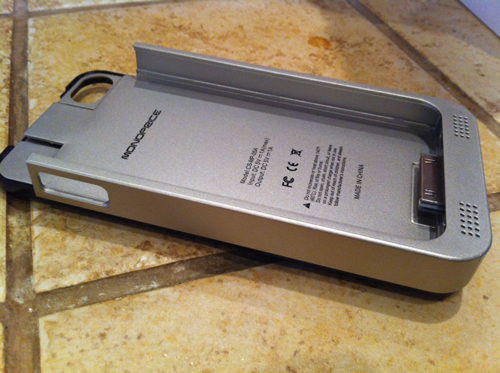 First, I’ve noticed that the iPhone battery seems last longer than I did before I bought the case. Second, when I recently set the phone to recharge from the battery it only charged the phone up about 25% even though the LEDs had indicated that it had more charge. I’m still pleased with the charging case but if it is working out this way the one issue is that it’s possible to not have as much reserve power in the case as one might expect. At the moment I’m not certain this is happening. Updated 11/05/2011: I’ve stopped using the case on a regular basis. Overall, the main reason is that it was becoming less reliable. The charge rate was about the same but I’ve started noticing problems getting the USB connection to work. In addition, though it may just be a coincidence, since I updated the iPhone to iOS 5 I’ve lost the ability to charge the iPhone and the case at the same time. I can charge the iPhone using the case. I can also charge the case without the iPhone in it. But if I attempt to recharge the case and the iPhone, with the iPhone in the case, I receive a message that the iPhone doesn’t support charging from that accessory. Updated 04/11/2012: If the dock connection in the case still worked it would probably still be a useful case. Unfortunately, it simply doesn’t work properly any more. The battery seems fine but when charging the phone it will charge and then stop and then charge and stop again, etc. 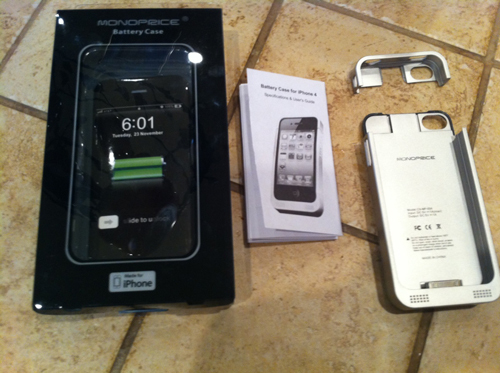 Updated 05/19/2012: I recently acquired a Mophie Juice Pack, which seemed more sturdy. Amazingly, the micro-USB charging port on the Mophie broke after less than two months and based on comments in other reviews this is apparently a common problem. This is far more than disappointing – it’s hard to believe that a device this expensive has such a flimsy, yet critical component. The Iphone jack in the inside of the case broke on mine after about 2 weeks. Definitely happy before that, but if the quality is that low then I guess I should have bought a similar product for more money. Mine still works but I’ve had some doubts about the strength of the dock connector in the case. In addition, as some other reviewers have complained, the USB port appears to be getting weaker. I seem to have more trouble getting the case to connect and charge. It works most of the time but not always on the first attempt to plug it in.